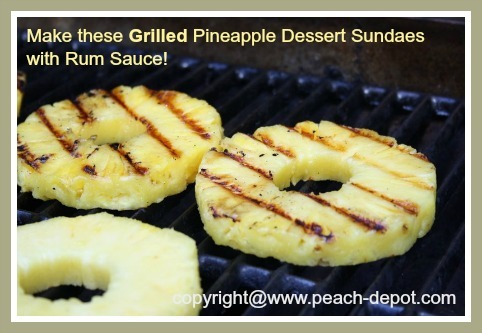 Make this Grilled Pineapple Dessert Recipe and wow your (adult) guests with this amazing idea for a grilled dessert following dinner around the barbeque! Top the grilled fruit over vanilla frozen yogurt OR vanilla ice cream. This recipe makes enough of a dessert topping for 6 people. I discovered this recipe in my morning newspaper and I am anxious to try it! 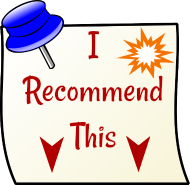 This recipe calls for fresh pineapple, but, as you can see from the instructions for grilling pineapple here, you could easily substitute the fresh pineapple with canned pineapple if you desire. Note - the pineapple can be grilled the day before and kept refrigerated until ready to serve the dessert. Pre-heat the gas grill to medium-high heat (400° F), with the lid closed. Arrange the prepared pineapple slices on the grill. Close the lid and allow the pineapple slices to cook for 3 to 4 minutes. Turn the pineapple slices over, reduce the bbq heat to medium, and cook for another 3 or 4 minutes, or until done. 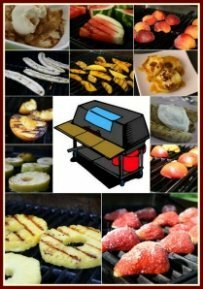 Remove the grilled fruit from the bbq, and allow to cool. Cut each slice into 1/2 inch size pieces. Combine the butter, brown sugar, rum, orange juice, vanilla, cinnamon and the ginger in a medium size pan over medium-high heat. Cook for about 4 to 5 minutes until the mixture comes to a boil - stirring constantly with a whisk to avoid sticking and burning. When the mixtures comes to a boil, reduce the heat to medium and cook for another 3 minutes. KEEP A CLOSE EYE ON THE SAUCE, if it gets too hot it may boil over! Remove the rum sauce from the heat and add the pineapple pieces, stirring to coat. Divide the pineapple sauce over individual scoops of vanilla frozen yogurt or vanilla ice cream. A oil spray bottle is a great aid when grilling fruit. It is also a great idea for adding oil to green salads.